The City of Johannesburg is calling on residents to propose names for 13 new Rea Vaya stations as part of its introduction process for the next phase of the project taking place between Alexandra, Sandton CBD and the Johannesburg CBD. 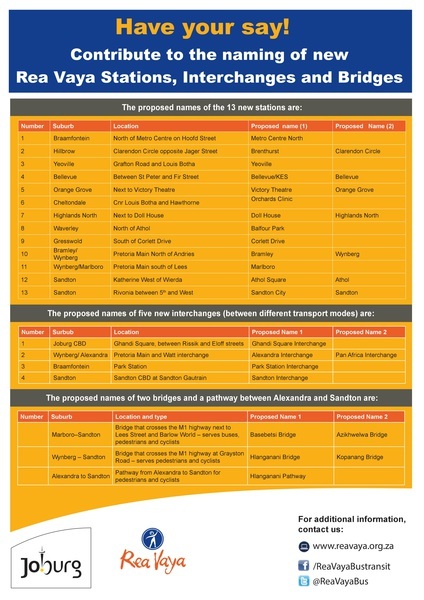 Residents have until 31 October 2017 to send their proposed names for the Rea Vaya stations as well as the pedestrian bridge over the M1 at Marlboro, four new interchanges, and a pedestrian path that is being completed in preparation for the Rea Vaya Bus Rapid Transit (BRT) between Joburg CBD, Alexandra, Greenstone and Sandton. “The City of Johannesburg policy requires that the members of the public must have a say in terms naming these new infrastructure projects that we are developing as part of the City’s transport master plan”, explains Nonhlanhla Helen Makhubu, the Member of the Mayoral Committee for Transport in the City of Johannesburg. The stations are in the third phase of Rea Vaya, that will be up and running by October next year between the Johannesburg central business district, Alexandra and Sandton to contribute to the growth and economic empowerment of disadvantaged people in those areas. “We are encouraging all Johannesburg residents to take part in this historic naming of the Rea Vaya stations, interchanges and bridges, in which names will be selected based either on the history of the area or a geographic landmark,” Makhubu says. Community leaders are also being consulted including all key stakeholders and city councillors. Members of the public can get involved with this historic event by visiting the Rea Vaya website. 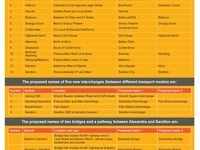 “For each station, bridge and interchange one or two names have to be suggested. However members of the public are free to suggest further names. The proposed names will be finalised by the City Council,” Makhubu concludes. Please submit your comments and naming recommendations to bennym@joburg.org.za or corrinel@joburg.org.za.